Intertops Poker employ the strictest anti-hacking security standards so you can deposit and withdraw your money with absolute confidence. 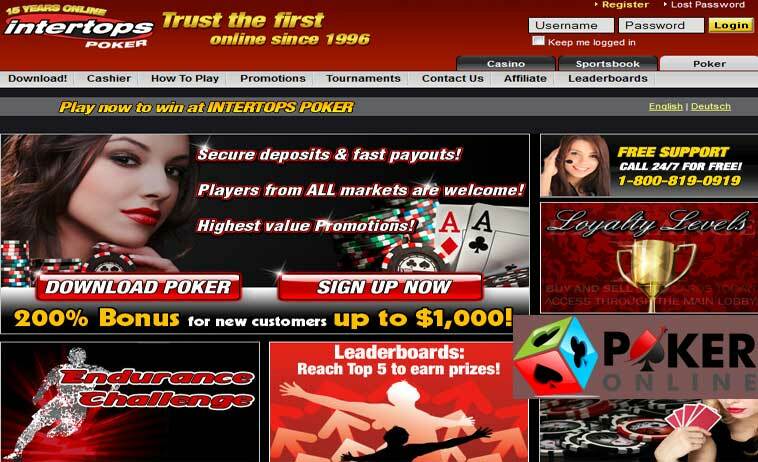 Intertops Poker, an online poker room on the Cake Network, is licensed and regulated in Curacao. Since it gives top priority to customer satisfaction and is committed to responsible gambling, players can play poker in peace at Intertops Poker. Remember to use your Intertops Poker Bonus Code to get your welcome bonusThe highlights of Intertops Poker are its generous first deposit bonus, its rewards for loyalty, lucrative poker tournaments, and excellent support system. The best way to boost one’s bankroll at Intertops Poker is to claim its first depositors’ bonus of 200 percent up to $2000. Players only have to download the poker client, register a real play account, make a deposit, and enter the bonus code 1000ITP to claim this bonus. The online poker room credits the bonus in increments of $5 as and when players collect the required Frequent Player Points (FPPs). Players are required to collect 83.335 to clear $5 of their bonus amounts. Intertops Poker encourages players to continue playing real money poker by offering them a reload bonus of 200 percent up to $1000 along with a free ticket to the Friday $250 Guaranteed Bounty Tournament, played at 1:00 a.m. GMT on Fridays. Reload bonuses, however, are available for a limited period only, but Intertops Poker makes these offers every now and then. Players interested in claiming the above-mentioned reload bonus must register right away. 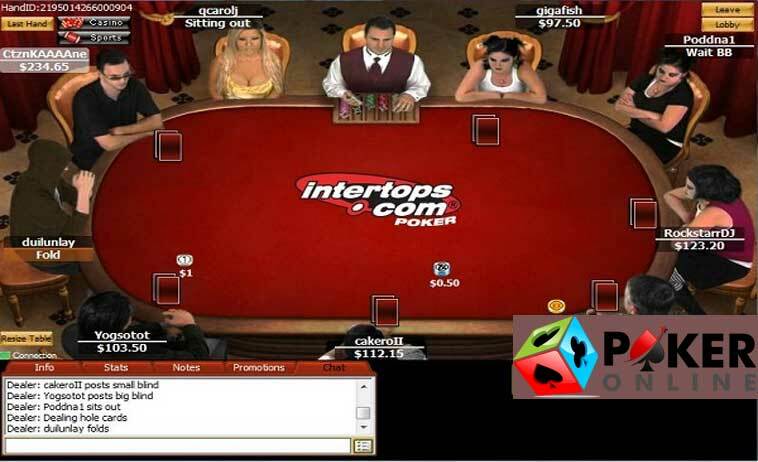 Intertops Poker offers most of the popular variants of online poker such as Texas Hold’em, Seven Card Stud, Seven Card Stud Hi-Lo, Omaha, and Omaha Hi-Lo in the form of cash games and tournaments. Online poker players can choose from a wide range of online poker tournaments such as multi-table tournaments, single table tournaments, freerolls, qualifier satellites to live poker events, and so on. The online poker room urges players to win cash, non-cash gifts, and prize packages to prestigious live poker events through its online poker tournaments. One of the most exciting events at Intertops Poker is the $25k Weekly Guaranteed, which is run on Sundays at 22:00 GMT. Players can either buy-in directly for the event or qualify through a number of satellite tournaments. The Sunday $1k Freezeout is also an interesting online poker tournament at Intertops Poker. It is run on Sundays and has 12-minute blinds with a starting chip stack of 2000 chips. Some of the other exciting weekly events at Intertops Poker include the Friday $250 Guaranteed Bounty and the $15,000 Weekly Guaranteed, which is played on Sundays. Intertops Poker is home to some impressive promotions. Since the online poker site modifies its promotions page regularly, the online poker experience at Intertops Poker is ever fresh, new, and changing. Intertops Poker rewards players in the most royal way possible. The online poker room rewards players for real money poker play with Frequent Player Points (FPPs). Players will receive 1 FPP for every dollar they wager. The FPPs earned at Intertops Poker are automatically converted into Gold Chips. Whenever players collect 100 FPPs, they will receive one Gold Chip. Players can then exchange their Gold Chips for entries to tournaments or real money prizes. Any real money poker player at Intertops Poker can get rewarded with Gold Cards. The online poker room offers Gold Cards at random to players who play cash poker games. Players can exchange their Gold Cards for real money or they can use their Gold Cards to buy-in to special tournaments. The rewards system at Intertops Poker comprises several loyalty levels, and players can ascend these levels by completing tiers. Each tier is associated with excellent bonuses, entries to tournaments, tickets to live events, and other benefits. Players can easily complete a tier by collecting the required number of Gold Chips through real money play. Banking at Intertops Poker is safe, secure, quick, and easy. Players can use methods such as Visa, MasterCard, Moneybookers, Instadebit, Neteller, Money Transfer, Money Global, UKash, PaySafeCard, Bank Wire Transfer, EcoCard, Click2Pay, and others to fund their Intertops Poker account. Beginners will initially find it difficult to identify the best banking method, but Inertops Poker makes things easy for beginners by providing complete details about each banking method in its cashier section. Intertops Poker has an excellent customer care service and offers assistance through phone, fax, email, Skype, and live help. Players can email their queries to poker@intertops.eu. Alternatively, they can use toll-free numbers to call Intertops Poker if they reside in North America, Germany, Austria, Switzerland, and UK. Players can use Skype to contact Intertops Poker.